The Third Anteroom is exactly like the Second in shape and layout. Its walls are faced with stucco and decorated with panels confined by borders of opaque blue glass, painted in oils with floral motiis, and having, in the centre, medallions with classical subjects executed in the same technique. The central panel presents a colourful composition, The Triumph of Amphitrite. To make the difference in the height of ceiling between this and the next building less noticeable Brenna again resorted to illusionistic perspective. The ceiling was painted by Gonzaga, who created a complex architectural composition showing a lofty classical interior with a dome, extending the architectural space of the room upward, toward an imaginary opening to the sky. 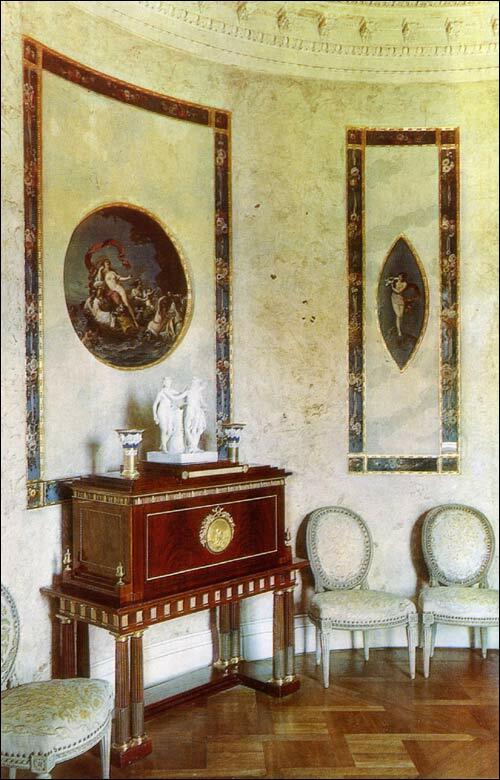 Though small, the apartment is decorated like a state drawing-room, with French furniture upholstered in eighteenth-century Lyons silk, made in the workshop of Louis Delanois, the famous cabinet-maker to Mme du Barry and one oi the originators of the classical style in furniture. The mahogany secretaire of original design, with bronze mountings, was made in 1784 by David Roentgen. Its legs, shaped like paired coiumns of the Doric order, support an architrave with bronze triglyphs. Its drop front is adorned with a medallion of chased ormolu, displaying the attributes of the sciences and the arts. A typical specimen of David Roentgen's work, the secretaire conceals a number of mechanical devices; it has' drawers and various secret compartments opened by pressure on a button or a concealed lever. On the top stands a sculpture of the Three Graces, executed in biscuit from the model of Gottfried Schadow; and also two small vases with wreaths of flowers in biscuit. The three pieces were made at the Berlin Porcelain Factory. The large porcelain vases of Russian make are similar to those in the Second Anteroom, except that the figures oi the satyrs and the rest oi the sculptural ornaments retain their natural white. The clock on the mantelpiece has the form oi a portico. Fashioned of black and white marble and chased ormolu, it was made at the Parisian workshop of Pierre Augustin Caron, watch-maker to the court, who later became famous as Pierre Beaumarchais,' the author of Le Mariage de Figaro. Rob Moshein has written an excellent article on the challenges of finding Jewish ancestors and creating your own family tree.